During 2016 there are 6 models I’m wearing in rotation, week in week out. These are from my “Active Group”that for me are both comfortable, useful and practical. I have various categories in my watch collection, from vintage to Vintage big names, to Classic dress and Milestone models and so on. But this question is about watches I wear on a day to day basis and they’re all models that for me are “keepers”. I rate them basically as they are each Practical, Affordable and each does what it’s supposed to do – very well. First I have the Breitling Aerospace 1999 model. It’s relatively small (in comparison with todays models) has absolute clarity, a great set of hidden functions, Titanium cased and in as good condition as bought, albeit a little smoother. Terrific timekeeper without RC, needs a battery change only every 5 to 7 years, so no solar. It is however the most “on the wrist” watch of my entire collection. 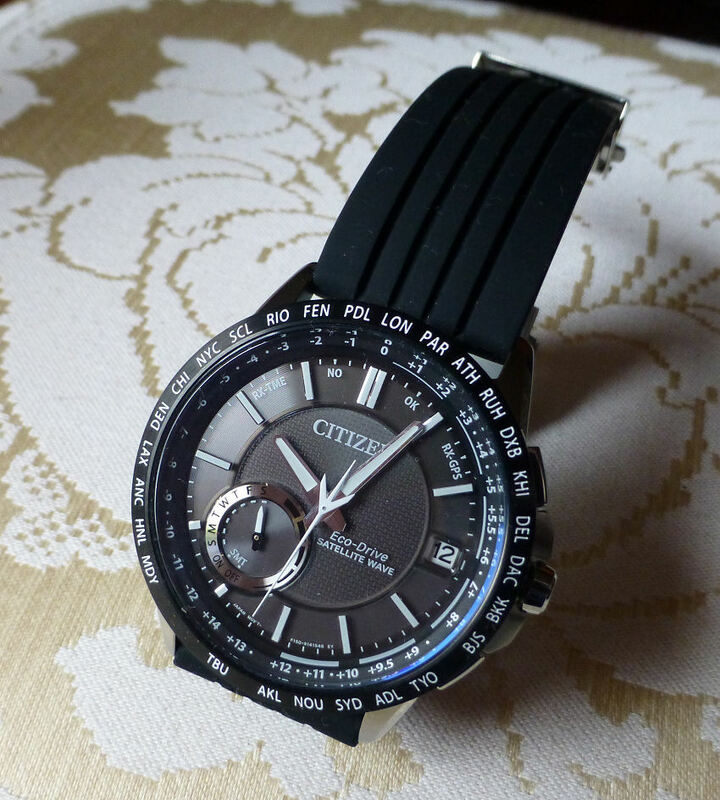 Interestingly though it’s an Ana/Digi model, which you might think was and is the preserve of the Japan big three (Citizen, Casio and Seiko), in functionality it’s better than most of them – in other words Breitling got it right. Second and third models are together as they appear at first glance to be from the same family. 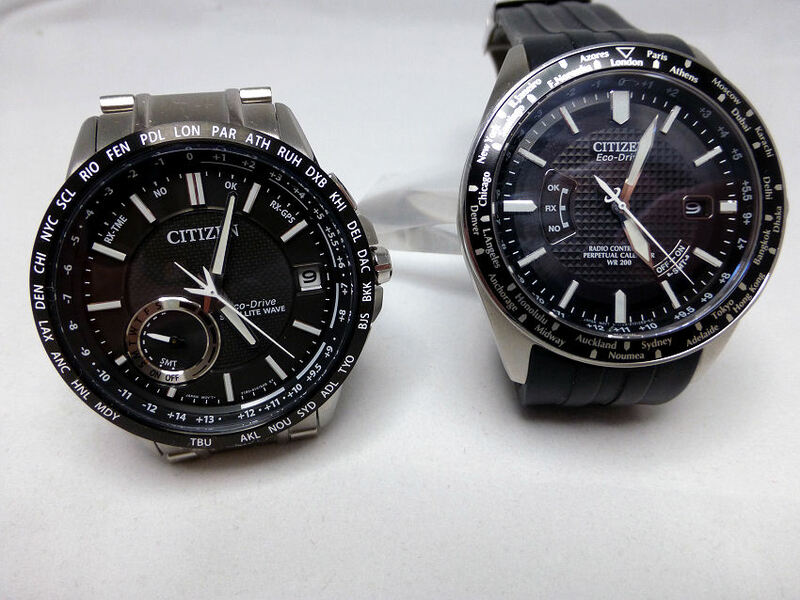 On the left is the Citizen CC3005-85E and on the right the Citizen AT CB0020-09E . They are both understated with classic analog dials. However in function they differ considerably. 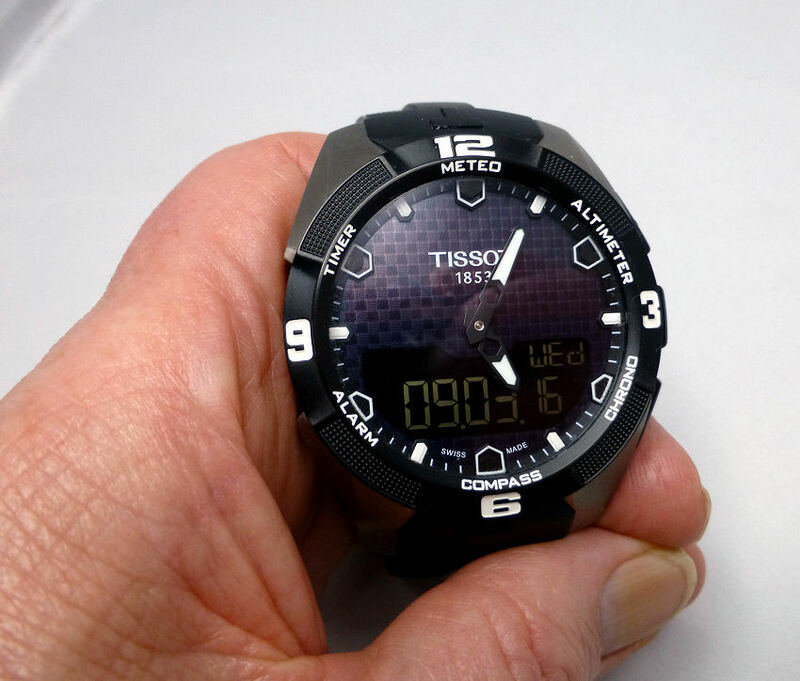 The AT has just a few functions, displays the Time and the Date, uses Eco-Drive and Radio Control and has the best travel World Time function I know – and it’s so easy to use. As usual with RC, sit the watch on the windowsill at night and it will update the time by receiving time signal from the nearest transmitter. For World Time simply pull out the crown turn to the city, push in the crown – job done. Facially the two models look very alike, but the CC3005-85E is thicker and heavier at 144 gms (after bracelet resizing) against the AT at just 94 gms (rubber strap). Function wise it also has Eco-Drive but no Radio Control – instead it has GPS Satellite control. The default glance on the dial shows the Time, the Date and the Day. Rather than use ground based Radio Transmitters, it uses satellites for Time control based on location. Oddly however whilst the AT seeks a time signal automatically, the CC3005 does not – this has to be a push button operation as and when you remember to do it. For basic Time Control however it is phenomenally fast! In the house I stood next to the window, pressed and released the lower push button (A) for a second or two – the second hand moves to indicate rx/time and then flicked to OK and almost instantly back to the corrected time. Total time was maybe 4 seconds! So this is much, much faster than Radio Control. Also with the cc150 movement at just +/- 5 secs per month, even without time signals it is the more accurate model. Full Satellite link you can really forget about once you’re set to your locality and basically use only when you travel – arrive at your location, press and release the lower button (A) for around 4 seconds this time, the second hand indicates rx/gps and will seek the satellites. Best to direct it towards the sky and within a short period the watch is updated with your new Zone local time. Another point to note is that with such as simple dial set up and ease of use, it is quite amazing that such technology is hidden beneath such an unobtrusive exterior. 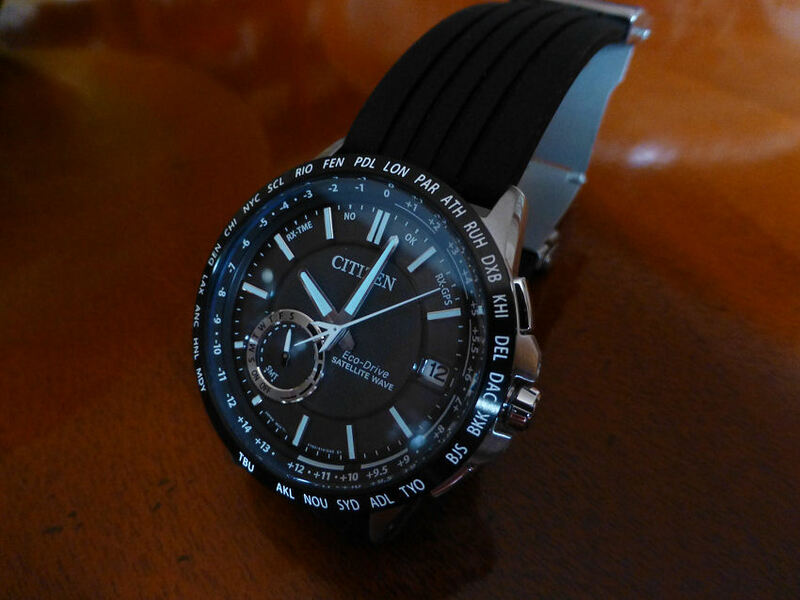 Note – My reviews are shown HERE and HERE – Note 2 – Updated the CC3005-85E Citizen 10th March 2016. 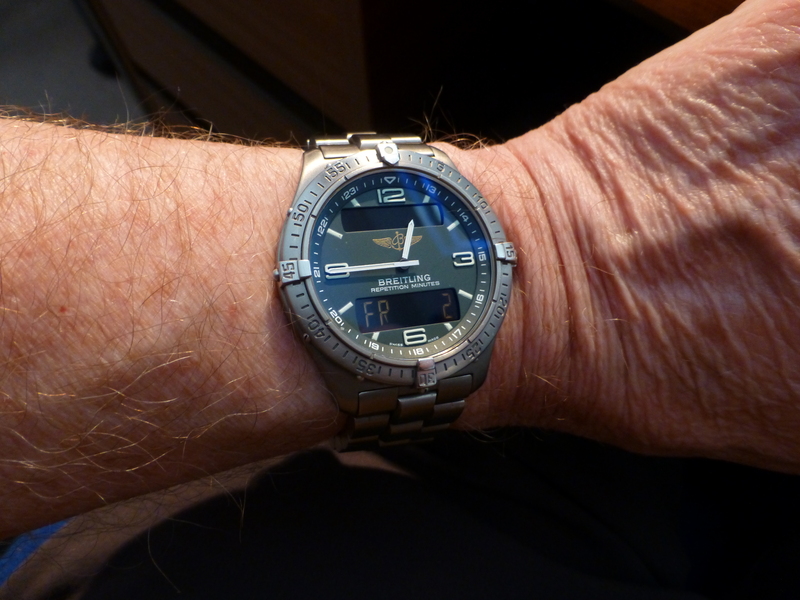 My fourth choice is a real power function watch – and arguably the best ABC model today. 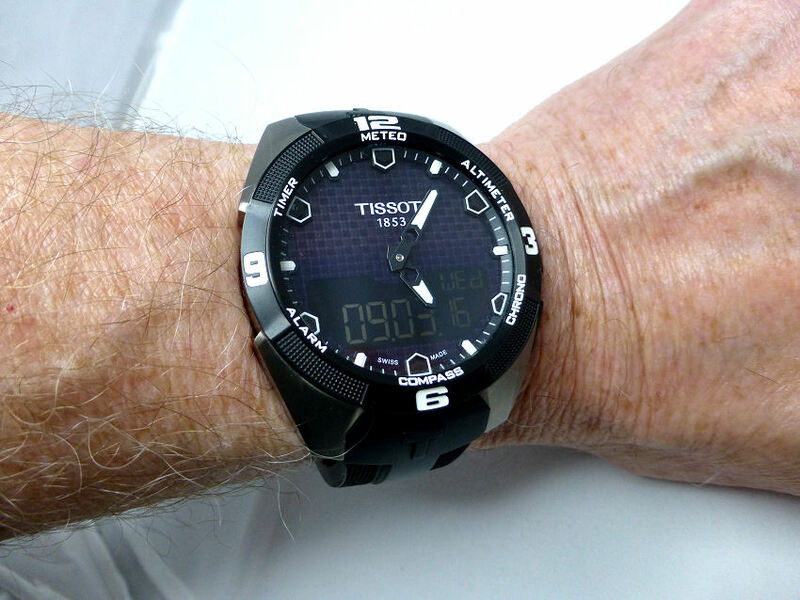 The Tissot Solar Touch Professional. An ABC watch that manages to out do most of the Japanese versions at their own game. 26 different functions hidden under the guise of a deceptively easy to read simple, simple dial. The normal at a glance view is Time, Day, Date, Month, and Year. Select a function however and the display instantly alters to show the selected data exclusively (I don’t know of another that does this) such as Digital Compass or Altitude or Barometric Pressure, or a Timer or Chronograph or Alarm. It is also a remarkable time keeper without RC and when checked against my RC clock each week I see little difference. So no Radio Control but like the Breitling this is compensated by a superb movement. 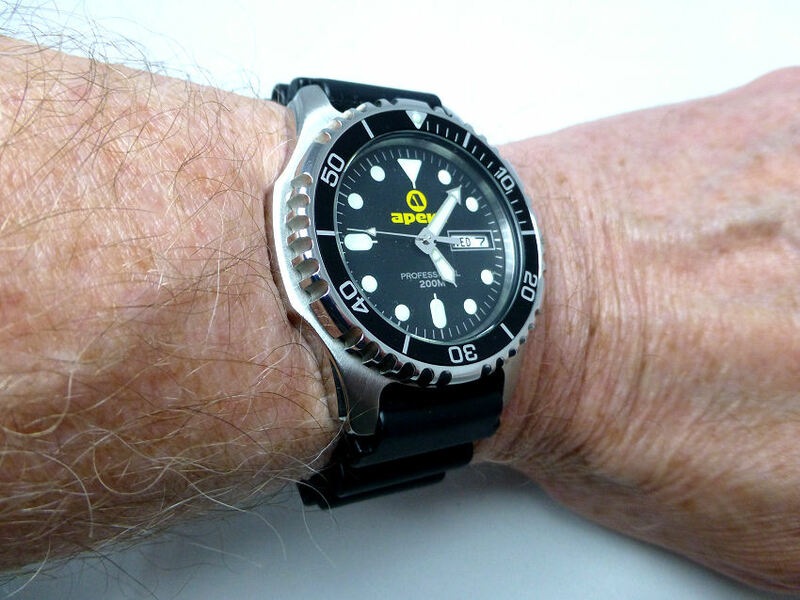 My fifth model is the very practical Diver – the Apeks 200 m Day and Date in stainless steel. Unobtrusive, very easy to read day or night, very tough and highly water resistant, very neat and compact so doesn’t look as if I’ve just emerged from the sea and taken off my wet suit, tanks and goggles. It is one of those models that looks good in any situation. Can’t say more as it’s just a great watch and does it’s job. 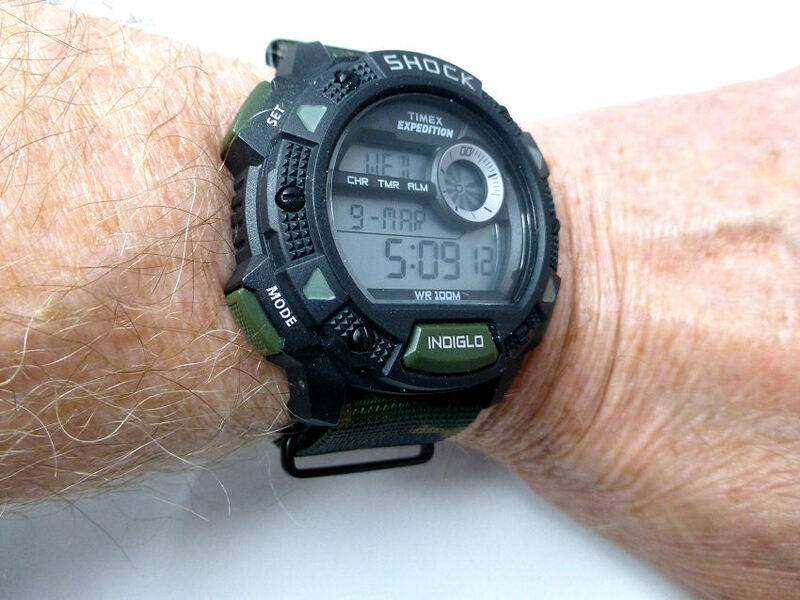 Sixth and final model is the so, so practical and versatile Timex Expedition T49976. This is a model Timex managed to get dead right. Everything is as it should be and just perfect at it’s job. Very easy and so intuitive to operate, it is a triumph of function and value for money and in my opinion beats most Casio equivalents. Note that some of these models have been around a while, yet are still currently available. To me this shows that some watch models are just “right”, totally “fit for purpose” and within their class, improvement is not an option. So for 2016 I am very pleased with my “beaters” and my question has to be – What will turn up for next year and will they be any better? 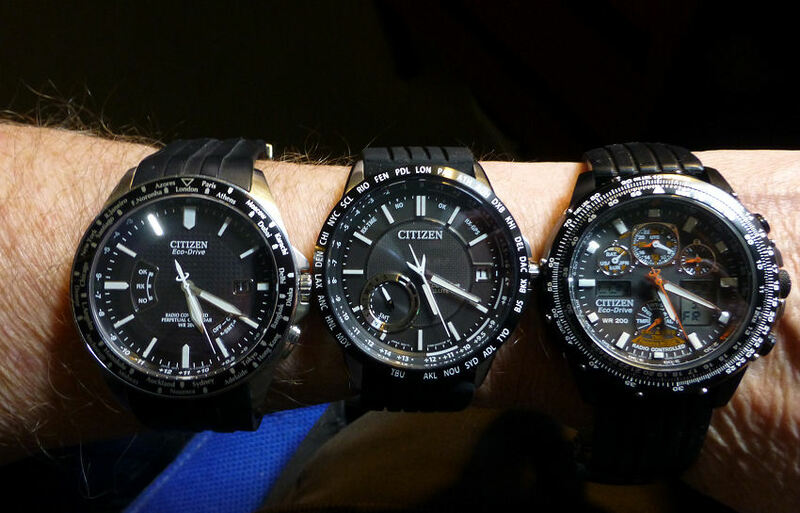 These taken today (11th March 2016) and show the Citizen CC3005-85E against my Citizen Skyhawk – very similar dimensions and both fitted with alternative Silicon deployment straps. The CB0020-09E AT model has the original bespoke strap without standard spring bars unlike the other two. 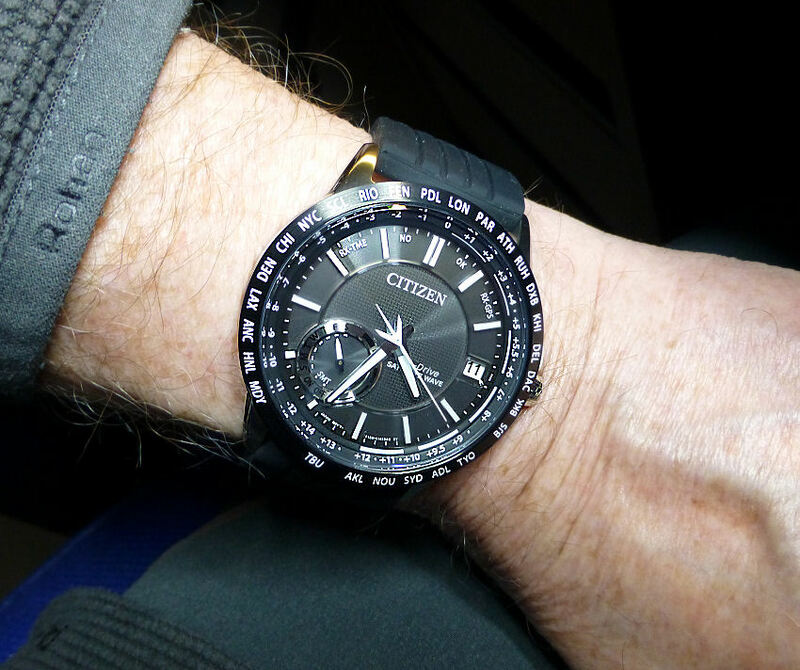 Note the change of strap to silicon reduces the weight of the CC3005-85E from 144 gms to 101 gms and it feels much lighter on the wrist and is actually a good fit (24mm Strap width). 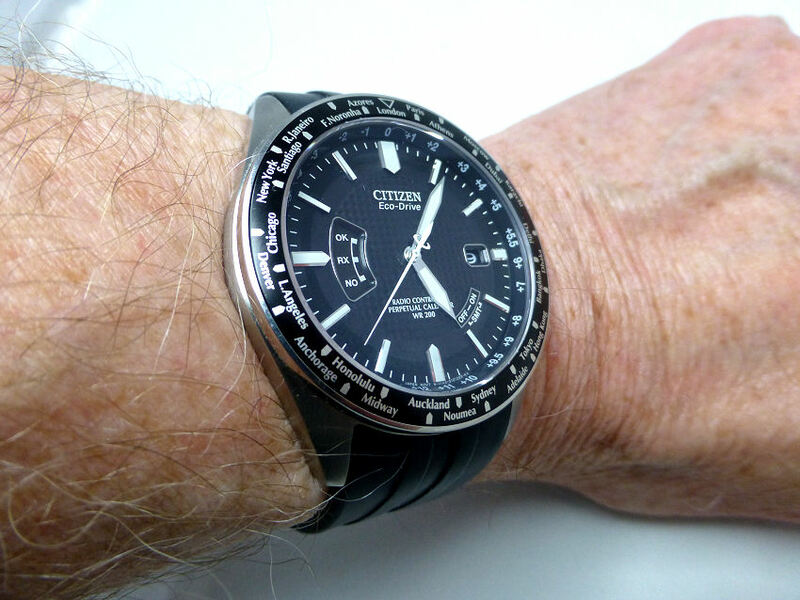 Citizen CC3005-85E with silicon deployment strap alternative (24mm) – Note – the top left lug is simply reflecting a gold colored lampshade on my desk. Great luminous qualities on a super simple dial. I have not included any of the “collectors” specials I might have – no Cartier or Jaeger LeCoultre or Omega, or IWC or Genta or Muller or Vacheron or Patek or Breguet or some gems I have from before 1900, because generally these are display pieces – perhaps worn on very special occasions (and sometimes never), because that’s not what my web site is about frankly. 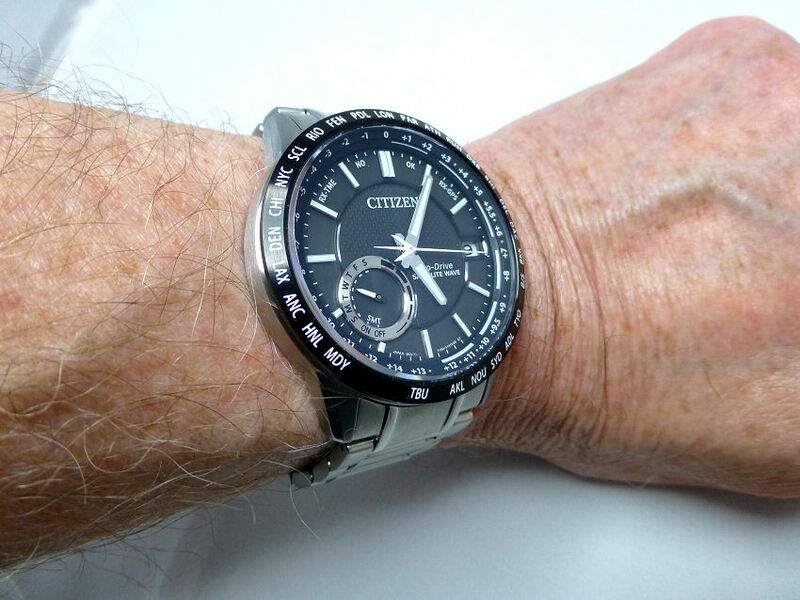 But the models featured here are all affordable, practical and useful, and in the case of the latest Citizen CC3005-85E a culmination of many years of research and technology. The result of which is a device that “simply” provides the basics and displays the Time – wherever you are! As to the rest of course there are countless different watch models, catering for every sort of taste and price range. So that said I Post this as just my own take on it all, a small section of my watches – what I call my “active” group of what I’m wearing, for this year anyway. These are the ones that for the moment it all basically comes down to, and that’s after the many hundreds of watches I’ve bought, owned and sold on over the years.